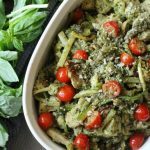 The bright, fresh flavors of basil and tomato in this skillet pesto chicken remind me of long summer days, frosty glasses of herbal tea, and relaxation. 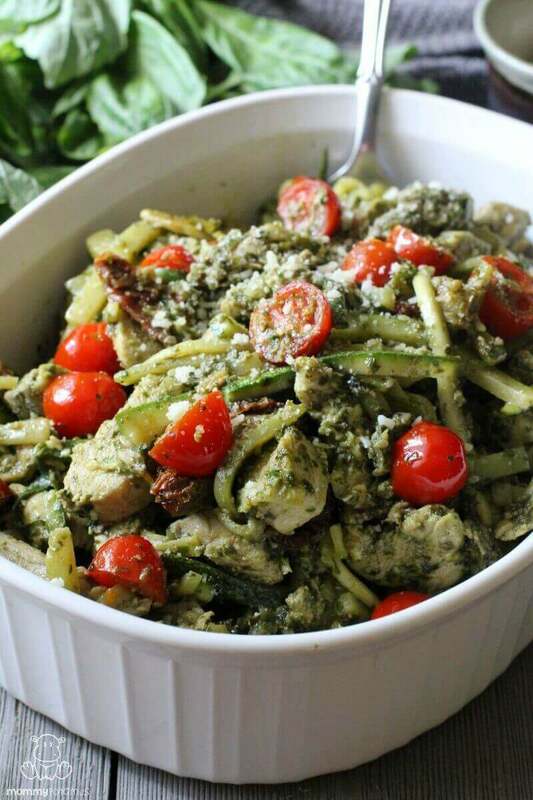 This chicken pesto pasta is a one-skillet meal, which means fewer dishes to clean up (yay!) and more time to sit around and talk about what we’re thankful for around the table. 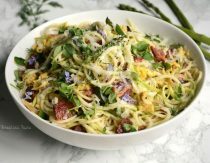 In place of traditional pasta, I use julienned zucchini as our noodles – it’s a great way to incorporate extra veggies into my family’s diet and my kids love them. A mandoline slicer like this one makes nice, thick noodles – which are best in this recipe – as does this spiralizer. However, you don’t need either of them to make this recipe – all it takes is a good knife and a few minutes to slice the zucchini into strips by hand. Looking for more ways to use zucchini? Warm the olive oil/ghee in a large pan over medium heat. Add in the chicken and zucchini and cook for 5-10 minutes, stirring occasionally. When the chicken is fully cooked, add in the tomatoes and sautee for another 1-2 minutes. 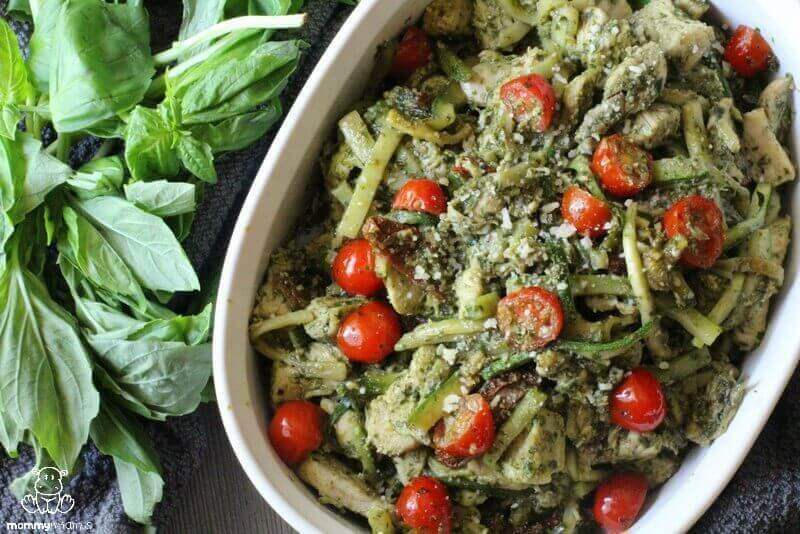 Remove the pan from heat and stir in the pesto, making sure the chicken and veggies are evenly coated. Sprinkle with cheese if desired, taste and add salt if needed, then serve. Your dish looks delicious – and the idea of all that lovely fresh basil is making my mouth water! Thanks for stopping by, April! If you happen to try it I’d love to know what you think! I love your info. Land read you almost daily. I would like to make a suggestion if I may. Olive oil is healthy for salads but because it oxidizes quickly, it is not so for cooking. Avocado oil is very healthy and a great alternative. Thanks. Perfect! 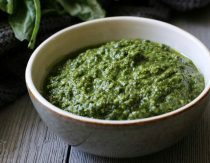 I just made some pesto. I didn’t have enough basil in the garden yet so I added spinach for half of the basil. I also sautéed squash, a few green/yellow beans, a handful of garden peas and two extra small cabbage heads, chopped. I will now chop some chicken from leftover grilled drumsticks to add to the mix-yum!! Thank you!